One of our most popular custom briefcases. 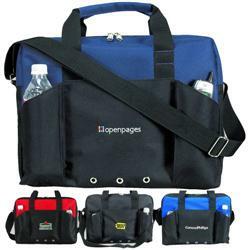 Dual front pockets, zippered main compartment with interior organizer, padded handles and strap. FREE 1-DAY RUSH PRODUCTION AVAILABLE! Available Colors: Navy, Royal, Red and Black. Dimensions: 16" x 12" x 4". Typical Imprint Area(s): 5 1/2" x 5" for a screen. Available Imprint Options: Screenprinted. Please inquire for embroidery cost. Standard 25 lbs. (approx.) @ 25 per carton.